In 1985, utility outfielder Lynn Jones had a hand in winning the World Series with the Kansas City Royals. When his playing career ended, Jones put his experience to good use by becoming a minor league manager in both the Florida Marlins and Boston Red Sox organizations. It was while managing the Kane County Cougars for the expansion Marlins that Jones helped bring up the youngsters that would go on to win the 1997 World Series. 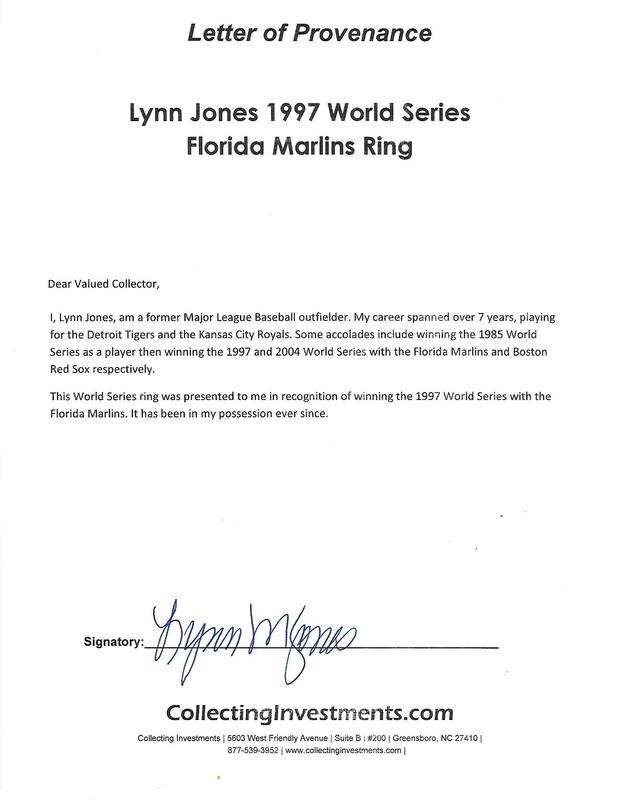 For his part in the Marlins’ first World Championship, Jones was presented with this 10-karat gold ring. The top of the ring has the Marlins mascot leaping out of the diamond-encrusted center with an “F” superimposed on top. The edge has “WORLD CHAMPIONS 1997” in gold raised letters. The left shank has “JONES” in raised letters above a Marlins logo with “5th SEASON” and “PL DEV” [Player Development] below. The right shank has the World Championship trophy with the Marlins logo and the team’s 1997 rallying cry “ONE HEARTBEAT” in raised gold letters. The inside has been inscribed with “MANAGER KANE-CO.” and a "10K" hallmark. The size 12 (52 grams) ring exhibits very light dings and abrasions on its surface from use by Jones, and displays very well with no condition issues. A nice Championship ring issued to one of the men who laid the groundwork for the Marin's first World Series title. Includes LOA from Lynn Jones.